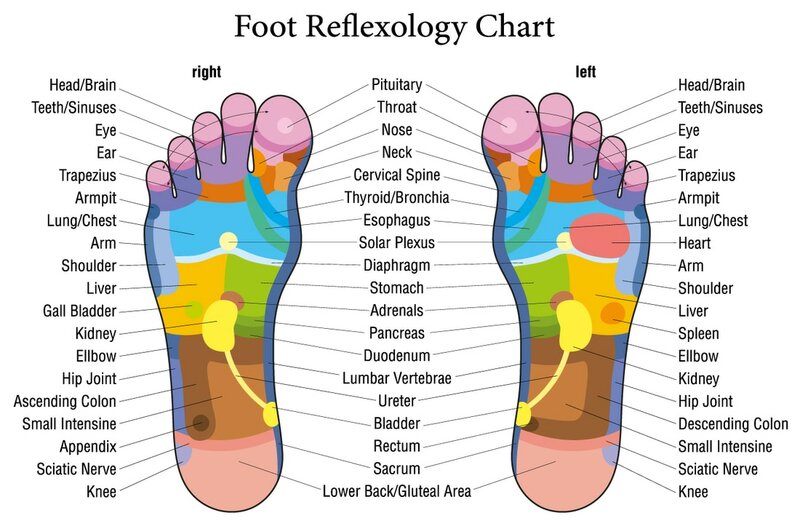 Reflexology is a complementary healing art, applying specific touch techniques to points and areas, or reflex maps, that are believed to exist on the feet, hands, or ears. The belief is that these maps resemble the body, corresponding to the various organs and systems of the body. Reflexologists feel that by using these particular touch techniques on these maps, a beneficial effect can be achieved, affecting the organs and client’s general health. The primary goal for many reflexologists is to help ease the effects of stress on the body. By applying nurturing touch in specific ways, a wide range of health benefits have been reported. For example, reflexology holds that a specific spot in the arch of the foot corresponds to the bladder reflex point. When a reflexology practitioner uses thumbs or fingers to apply appropriate pressure to this area, it can affect bladder function. Although reflexology is not used to diagnose or cure health disorders, millions of people around the world use it to complement other treatments when addressing conditions including anxiety, asthma, cancer treatment, cardiovascular issues, diabetes, headaches, kidney function, PMS, and sinusitis. Foot, Hand, and Ear (FHE) Reflexology– What is it? There are varying types of Reflexology practiced throughout the world. All are valid, and can achieve many desired goals. FHE REflexology is one of these, integrating the benefits of using all three areas. Being able to combine all three is powerful, using them in the most effective way to benefit the client. More options are provided by using all three. If a client has injured their foot for example, the practitioner can facilitate the healing of that foot through the other foot, hands and ears. Many forms of reflexology use feet or feet and hands and achieve wonderful results. Including the ears can increase those results, thereby enhancing the overall effect. Using the feet, hands, and ears in combination adds many more avenues to the healing process. Reflexology is growing increasingly popular across Europe, Asia and the US, as both a complement to other treatments and as a preventive measure. One example is Denmark, where various municipalities and companies have employed reflexologists since the early ’90s.